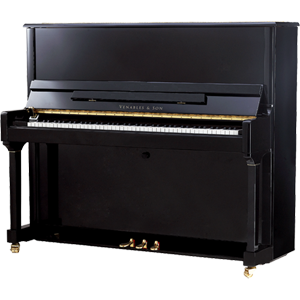 The moment you play the Studio 125 upright piano, you will appreciate its warm, rich tone with an extraordinarily deep and pure bass. An impressive combination of increased string length, soundboard area and 5 solid spruce backposts make for these tonal refinements. Increased action height provides extended leverage, giving greater control, balance and expression. We recommend the Venables & Son Studio-125 for the advanced player seeking a lyrical tone and responsive touch. The relatively low price is a welcome bonus.